Product prices and availability are accurate as of 2019-04-21 05:08:26 UTC and are subject to change. Any price and availability information displayed on http://www.amazon.com/ at the time of purchase will apply to the purchase of this product. Winkeyes MTB saddle bag is hard wedge shell, well made of high duty nylon material, very durable and anti-deformation. 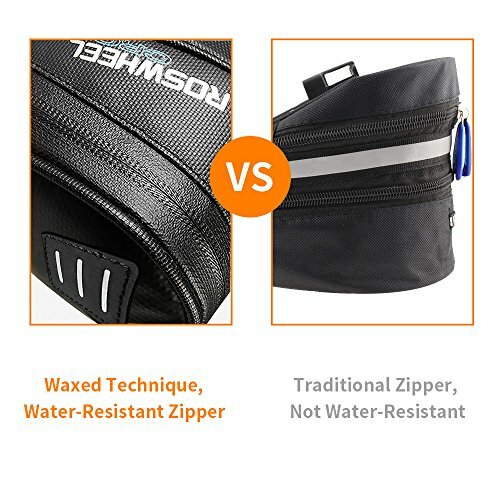 Its wax technique makes this kind of road bike bag rainproof and mud proof to keep bicycle accessories inside very dry. 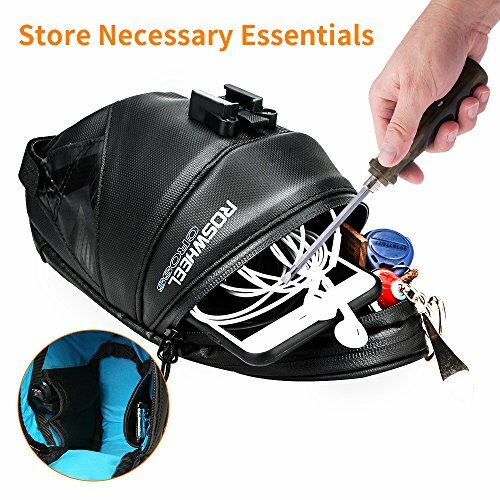 While cycling, you should have this kind of storage bag with you to keep bicycle reapir tools to solve unavoidable emergency like repairing bikes. It's a really good riding storage helper! ?Expandable zipper can make the bike bag capacity(1.4L-1.6L) larger or smaller according to your need. ?Tail reflective strips increase nighttime visibility and can mount a rear light, keep your night ridding more safe. ?Well designed shape can minimize air resistance when you are enjoying your high speed cycling experience. 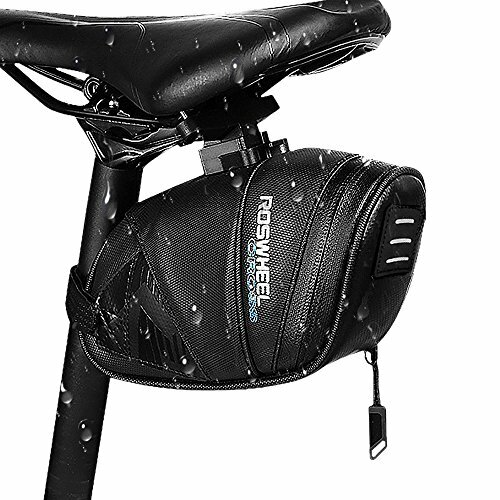 ?Waterproof Waxed Material?-The saddle bag is well made of high duty tear-resistant waxed 1680D nylon material and waxed sturdy zipper, can perform the best protective function to keep valuable bike accessories from water, mud and dust. Easily and quickly clean by wiping. Zipper closure makes this saddle bag easily open and close. ?1.6L Expandable Capacity?- The room of the bicycle storage bag can be freely adjusted from 1.4L to 1.6L based on your need. 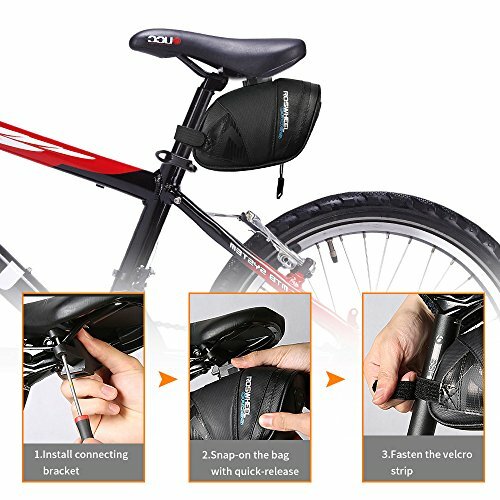 So, the capacity of the bike accessories bag is enough big to store cycling essentials for your bike tour like tire repair kit, keys, wallet, mobile phone etc. Small pockets inside the bag can put small items and prevent them messing up and falling down. 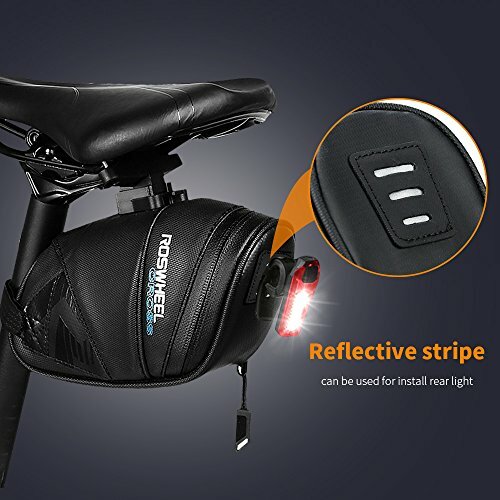 ?Safe Bike Tour?- The reflective strip on the back of mountain bike bag makes mountain biking in the evening or under bad weather condition much safer. Also, cyclists can mount a bike taillight on a hanger at the back of mountain bike saddle bag to warn people behind (taillight not included). ?Lightweight & Durable?- The bicycle pack is light and handy with only 0.6lbs. Cyclists can save physical efforts while climbing mountain road. The bag is also durable for long time use with good nylon material described as above. ?Quick Installation?- Easy and quick installation and unloading. The heavy-duty buckle and straps can fix the bag firmly to prevent bag body wobbling. Ideal fit for most types of saddle racks and seat posts of mountain bike, road bike and folding bike.